4mm clear plate polycarbonate is ideal for secondary glazing windows where strength is important. Low cost, fast installation solution for reducing heat loss through your window. 250 times stronger than 4mm glass. As well as 4mm Plate Polycarbonate Glazing Panels Omega Build supply a range of roofing components such as roof lanterns, roof domes, diy conservatory roof kits, polycarbonate roofing sheets, polycarbonate canopy kits, door canopy kits and much more. I would recommend your affordable products (4mm Plate Polycarbonate Glazing Panels) to anyone else considering this product, as it has been superb. Omega Build Shop | 4mm Plate Polycarbonate Glazing Panels. 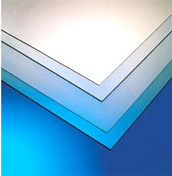 You are viewing 4mm Plate Polycarbonate Glazing Panels, buy online today!